Is your external hard drive not recognized on your PC? It’s so much frustrating I guess. Nowadays Hard drive issues has been the deal of the day, we’ve heard lot of people complaining on this same issue every blessed day. Lot of computer users have come across this issue many times even after connecting the drive as it ought to be, but still it doesn’t reflect. Therefore, we’ve come with the solution to this problem. 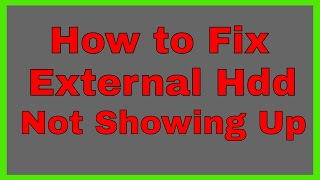 In this article I will be guiding us on How to Fix External Hard Drive not Showing on My PC. Before I continue, I would like to make us understand those things that may cause your external hard drive no to reflect on your PC. Virus: are you sure your external hardware is not affected by any virus? if your hard drive is been affected by any virus, then there is probability that is doesn’t reflect on your PC. Damaged USB port: have you checked your PC USB port? Try and check because in most cases the USB port might have been damaged, but you might be unaware. Check your drive: the worst part is that your external hard drive might have been damaged. So, you need to run a check before you take the next step. external hard drive not initialized. First and foremost you need to create partitions on your drive. There are lots of questions we’ve come across on how to partition a drive when it’s not been visible by computer. Well the answer is; for you to partition your drive, you need a tool called partition manager for this. All you need to do is to get it downloaded on your PC. After you’ve finished downloading this tool, you can then be able to partition your drive. At this point I will highly recommend EaseUS Partition Master. This software is absolutely free. You have no cause to pay for anything. With this software you can be able to partition a new drive as well as repairing external hard drive without losing any data at all. If you are wondering on how to us this software in repairing and restoring your external hard drive, then all you just need to do is to follow the guides which will be stated below. Plug in your external hard drive and open the EaseUs partition software. After lunching the software for free, your external hard drive would be labeled UNALLOCATED. Now click on the label and right click, there will be an option if you want to create PARTITION. Then click to create partition. After you might have created the partition; a mini window will appear. On this mini window, insert the PARTITION LABEL while assigning any drives letters or a file. After you have finished following the steps above, you can now click on APPLY to complete the task. There you go. Now close the partition manager and go to your file manager to check if your hard drive not showing up in disk management. I hope you find this article helpful. Thanks and stay tuned for more useful article by GadgetSpirit.